Active United States military aircraft is a list of military aircraft that are used by the United States military. For aircraft no longer in-service see the list of military aircraft of the United States. AC-130 Stinger II, Ghost Rider, Spooky II Lockheed & Boeing USA Propeller Gunship 1968 35 AC-130U, AC-130W and AC-130J. B-1B Lancer Rockwell USA Jet Bomber 1986 62 Only supersonic bomber aircraft active in the U.S. Air Force. B-2A Spirit Northrop Grumman USA Jet Bomber 1997 20 Slated to remain in service until 2058. B-52H Stratofortress Boeing USA Jet Bomber 1955 75 Slated to remain in service through 2050. C-17A Globemaster III McDonnell Douglas later Boeing USA Jet Transport 1995 222 U.S. Military C-17's were produced by McDonnell-Douglas prior to the merger with Boeing. Boeing continued production of the C-17 for sales to non-U.S. Military customers. C-40 Clipper Boeing USA Jet VIP Transport 2001 14 C-40B and C-40C. 1 on order. C-130H Hercules Lockheed Martin USA Propeller Transport 1956 188 Most C-130H serve in the ANG and AFRES. F-15 Eagle McDonnell Douglas USA Jet Fighter 1976 236 212 x F-15C, 23 x F-15D. Currently being upgraded to remain in service beyond 2030 the aircraft will eventually be replaced by the F-22. F-15E Strike Eagle McDonnell Douglas USA Jet Multirole Strike fighter 1988 213 Currently being upgraded to remain in service beyond 2030. 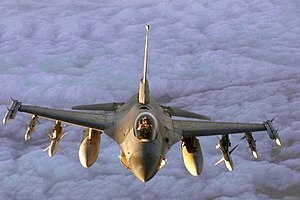 F-16 Fighting Falcon General Dynamics USA Jet Fighter 1978 786 x F-16C, 155 x F-16D To be replaced by the F-35A. F-22A Raptor Lockheed Martin USA Jet Fighter 2005 187 No longer in production. HC-130 Combat King/Combat King II Lockheed Martin USA Propeller Search and rescue 1954 29 9 x HC-130N/HC-130P. 78 x HC-130J planned, of which 20 currently on order. T-1A Jayhawk Raytheon USA Jet Trainer 1992 157 Originally 180. Two crashed after mishaps. Trainer aircraft 1957 31 27 x U-2S, 5 x TU-2S. To be replaced by the RQ-4 Global Hawk block 40. HH-60 Pave Hawk Sikorsky USA Helicopter Search and rescue 2016 99 HH-60G and HH-60U. To be replaced by 112 HH-60W from 2021. C-12 Huron Beechcraft USA Propeller Cargo/Transport 104 C-12C, C-12D and C-12F. 5 on order as of December 2015. Italy Propeller Cargo aircraft 6 Former Air Force aircraft used by Army Special Operations Command for training. RC-12 Huron Beechcraft USA Propeller Reconnaissance 83 RC-12D, RC-12H and RC-12K. 6 on order as of December 2015. AH-64 Apache Longbow, Guardian Boeing USA Helicopter Attack 1986 792 AH-64D and AH-64E. 25 on order as of December 2015. MH-60 Black Hawk Sikorsky USA Helicopter Multi-mission 58 23 x MH-60K, 35 x MH-60L. UH-60 Black Hawk Sikorsky USA Helicopter Utility 1,443 751 x UH-60A, 592 x UH-60L, 100 x UH-60M. 1227 UH-60M planned. CQ-10 Snowgoose MMIST Canada UAV Transport 2005 15 49 planned. Parafoil and autogyro variants. RQ-7B Shadow AAI Corporation USA UAV 450 68 on order. Italy Propeller Search and rescue 14 Former Air Force aircraft. C-37A Gulfstream USA Jet Command & Control 2 VIP transport for high-ranking members of the Department of Homeland Security and U.S. Coast Guard. HC-130 Hercules Lockheed Martin USA Propeller Search and rescue 33 5 x HC-130B or HC-130H (1500 series), 22 x HC-130H-7, 6 active HC-130J, 1 test, 3 in minotaur conversion, 4 under contract and in production. Spain Propeller Search and rescue 2009 18 The HC-144A will replace some HC-130s. CGAS Miami is the first unit to receive operational HC-144A's. F/A-18B Hornet McDonnell Douglas USA Jet Carrier-based Trainer 4 Training, 3 Stored 7 Scheduled to be replaced by F-35B/C Lightning II by 2019. F/A-18C Hornet McDonnell Douglas USA Jet Carrier-based Fighter 60 Active, 12 Training, 47 Stored 119 Scheduled to begin replacement by F-35B/C Lightning II starting 2019. F/A-18D Hornet McDonnell Douglas USA Jet Carrier-based Strike 48 Active, 20 Training, 24 Stored 92 Scheduled to begin replacement by F-35B/C Lightning II starting 2023. F-35B Lightning II Lockheed Martin USA Jet Carrier-based Fighter 32 Active, 25 Training 57 V/STOL variant. Planned total of 353 F-35Bs and 67 F-35Cs (CTOL) to replace various aircraft. F-5N Tiger II Northrop USA Jet Aggressor 12 Scheduled to maintain service till 2026. UC-12W Huron Beechcraft USA Propeller Utility 8 8 Scheduled to replace the UC-12F/M Huron by 2024. UC-12M Huron Beechcraft USA Propeller Utility 2 2 Scheduled to be replaced by UC-12W Huron by 2024. UC-12F Huron Beechcraft USA Propeller Utility 4 4 Scheduled to be replaced by UC-12W Huron by 2024. UC-35D Citation Cessna USA Jet Utility 10 Active 10 To be replaced/upgraded to UC-35 ER. UC-35C Citation Cessna USA Jet Utility 2 Active 2 To be replaced/upgraded to UC-35 ER. AH-1W SuperCobra Bell USA Helicopter Attack 1986 55 To be upgraded to or replaced by AH-1Z Viper. CH-53E Super Stallion Sikorsky USA Helicopter Cargo/Transport 96 Active, 6 Reserve, 10 Training 142 To be replaced by CH-53K King Stallion, in flight testing - 2015. MQ-8B Fire Scout Northrop Grumman USA UAV Multi-Mission 2009 27 Helicopter. EA-18G Growler Boeing USA Jet Carrier-based Electronic-warfare aircraft 113 18 on order. F-16 Fighting Falcon General Dynamics USA Jet Fighter aircraft 14 Used for adversary training. F/A-18 Hornet McDonnell Douglas USA Jet Carrier-based Fighter aircraft 267 F/A-18A, F/A-18B, F/A-18C and F/A-18D. F/A-18E/F Super Hornet McDonnell Douglas / Northrop Grumman then Boeing / Northrop Grumman USA Jet Carrier-based Fighter 512 F/A-18E and F/A-18F. 22 on order. T-6 Texan II Beechcraft USA Propeller Trainer aircraft 294 29 on order. CMV-22 Osprey Bell Boeing USA Powered lift Multi-mission 1 48 on order. MQ-8B Fire Scout Northrop Grumman USA UAV Patrol 2009 27 Helicopter. 96 planned. ^ Trevithick, Joseph (9 March 2018). "Here's A Handy Inventory List Of USAF Aircraft And Their Mission Capable Rates". The Drive. Retrieved 16 January 2019. ^ "Lockheed Martin Deliver 300th C-130J Super Hercules". defenseworld.net. Retrieved 4 April 2016. ^ "Air Force Gets 300th C-130J Super Hercules". mil-embedded.com. Retrieved 4 April 2016. ^ "524th Special Operations Squadron | 524th SOS". Airforce.americanspecialops.com. Retrieved 3 March 2013. ^ "E-3 Sentry (AWACS)". United States Air Force. 1 November 2003. Retrieved 2 August 2013. ^ Tamir Eshel (21 September 2011). "U.S. Air Force Extends BACN Com-Relay Biz Jets Operations in Kandahar". defense-update.com. Retrieved 19 January 2015. ^ "The Aviationist » Networking From on High: Behind the Scenes of NASA's Spooky WB-57 Jet". The Aviationist. 8 January 2013. Retrieved 25 December 2014. ^ Shalal, Andrea (29 January 2016). "Boeing wins contract to build new Air Force One presidential jets". Reuters. Retrieved 16 May 2016. ^ "HH-60G Pave Hawk". af.mil. ^ "UH-1N Iroquois". U.S. Air Force. United States Air Force. Retrieved 29 September 2015. ^ "Non-standard Aviation - USAF Special Operations". Retrieved 25 December 2014. ^ "Northrop Grumman Receives $114 Million to Build Three More Global Hawks for US. Air Force". 9 November 2013. ^ "Alaska Army Guard receives 1 of only 3 C-12J airframes in the US Army". ^ "Gray Eagle Completes 20,000 Automated Takeoffs & Landings | sUAS News". 24 October 2013. Retrieved 7 May 2015. ^ "More RQ-7s for US Army". Flightglobal.com. 5 November 2012. Retrieved 3 March 2013. ^ "2015 Marine Aviation Plan" (PDF). Headquarters Marine Corps. Retrieved 29 June 2015. ^ Cifuentes, Michael S. "Marine Corps continues flying with Joint Strike Fighter program". Headquarters Marine Corps. Archived from the original on 1 March 2013. Retrieved 14 March 2011. ^ Whittle, Richard (13 January 2015). "Navy Decides to Buy V-22 Ospreys for Carrier Delivery". Breaking Defense. Retrieved 27 August 2015. ^ "F-5N/F Freedom Fighter | NAVAIR – U.S. Navy Naval Air Systems Command – Navy and Marine Corps Aviation Research, Development, Acquisition, Test and Evaluation". Navair.navy.mil. Retrieved 13 June 2011. ^ "F-16 Versions - (T)F-16N". f-16.net. ^ Drew, James (16 August 2015). "US Navy considers reduced annual F-35C buy". Flight Global. Reed Business Information. Retrieved 17 August 2015. ^ Moran, Captain Michael T. "P-8A Poseidon." Archived 28 July 2013 at the Wayback Machine NAVAIR – U.S. Navy Naval Air Systems Command – Navy and Marine Corps Aviation Research, Development, Acquisition, Test and Evaluation. United States Army 2010 Weapons System Handbook (PDF file, 41.6 mb) includes pages describing US manned and unmanned aircraft.